On Friday, July 7, the Ethnographic Museum of Krakow (MEK) brought a slice of Kabyle culture to its visitors. And it has more to it than Zinedine Zidane, the most famous living member of the ethnic group numbering around six million based in modern-day Algeria. The main idea behind the new exhibition titled Against the Grain: Kabylia – which will run until October 2017 – is to confront stereotypes of Islam and Africa through display of artifacts produced exclusively by women: jewellery and ceramics. Yet decorative handcrafted jewellery, handpainted ceramics and old postcard depictions of Kabyle women posed as seductive beauties are hardly the only reason why it is worth it to visit the Museum. 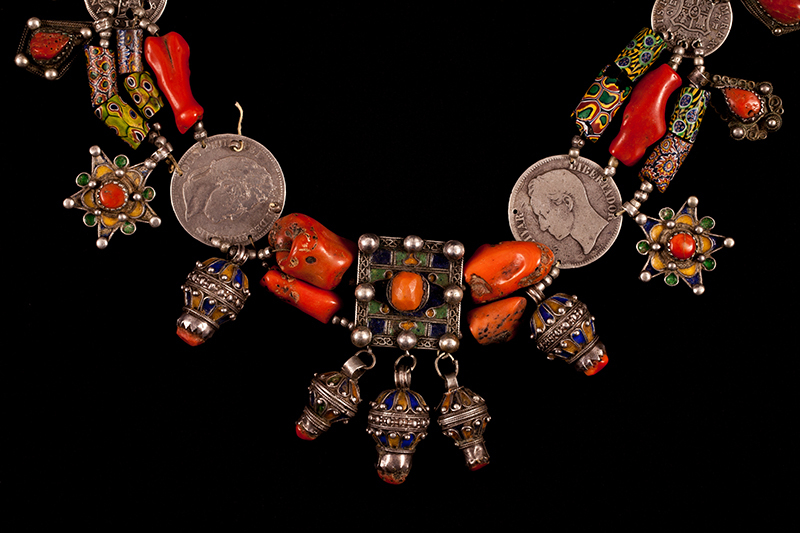 The very story behind the jewellery collection shown at the MEK adds additional layers to the tale of Kabyle culture and tradition, which have been largely created and preserved thanks to women. The presented artifacts mostly come from the private collection of Urszula Zanotti, who, as a rising star of Polish ice skating in the 1950s, left her Katowice high school to tour the world with a French ice show. One of her performances took place in Algeria, a place which became a turning point in her life, as it was there where she met George Zanotti. How did she end up as the owner of one of the largest private collections of Kabyle jewellery in the world? No spoilers here. You must check it for yourself. Against the Grain: Kabylia is the first exhibition in Poland about the Kabyle culture. The admission price includes a publication that helps position the exhibition in a broader context. I think that this exhibition is great for Poland! We need to learn about other cultures to become much more open minded about the way we interact with the communities present in Poland! Great article by the way!